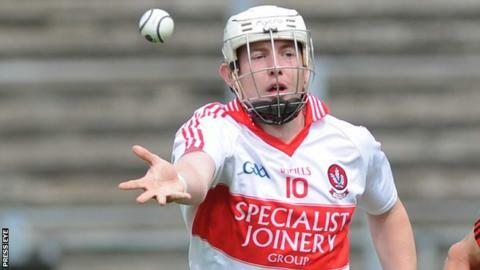 Paddy Henry's late 65 helped Derry defeat London 1-12 to 2-8 in Saturday's Christy Ring Cup game at Owenbeg. Henry also scored Derry's goal in the first half which helped the hosts to a 1-5 to 0-6 interval lead. Mark O'Dwyer's two goals enabled the Exiles to take the lead but Derry fought back to take the victory which earned them a semi-final place. London must regroup for a quarter-final against Down next weekend while Meath will face Kildare at the same stage. Venues for the two quarter-finals will be confirmed on Monday.